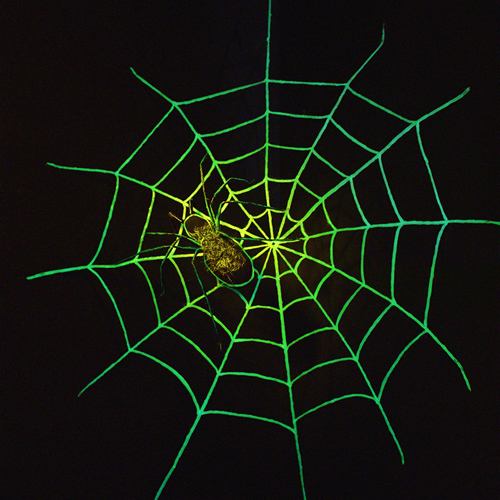 Simply follow our step-by-step guide and create the scary spiders in their glow-in-the-dark web! All you need is your Dremel Glue Gun and some special glow-in-the-dark hot glue sticks which are re-activated by light to make this spooky addition to your porch or window. Cut a 70cm piece of the baking parchment and fold it in half lengthways. Make a mark on the folded edge approximately 3cm in from one end. Then measure 62cm along the fold from this first mark. At right angles from this point, measure in 17cm on the parchment and mark this. Then simply draw a line to connect the 3cm mark on the fold with the 17cm in mark using a straight edge and marker pen, as shown below. Then, turn the folded paper over and trace the line to transfer it onto the opposite side of the paper so that you end up with a V shape, as shown below. Using our picture as a guide, draw five slightly curved lines between V shape, making sure they begin and end at equal points on the V.
Now, insert a 7mm Glow-in-the-Dark glue stick into your Dremel Glue Gun and set it on the high temperature. Turn the paper over and ‘pipe’ lines of glue along the long lines marked, repeating the process two or three times to thicken the lines and create a stronger result. Connect the long lines of glue by ‘piping’ the short curved lines in between, making sure the lines connect effectively where they meet. Repeat this process five more times to make a total of six web sections. You need to end up with 12 sections, so place a section of web either side of another V drawn onto the paper parchment as before, matching the edges. Use more glue to ‘pipe’ the curved lines in between the two sections to connect them together. This will create the first quarter of the web. To complete your web, repeat with the other sections, then join the three larger sections altogether using the same technique of aligning the sections on either side of the original drawing and using more lines of glue to fill in the gaps. Your web should be complete. To hang up your cobweb, use a staple gun to staple the ends of your web onto the corners of an outside porch or stick over a window. Now, buy either a giant toy spider or lots of small black furry ones from your local toy shop or online, and highlight them with glow-in-the-dark glue. Attach them to the web by tying them to lengths of black cotton or black wool. Beyond that it is simply a question waiting for darkness to fall! Your web should automatically start to glow as darkness falls because it has absorbed daylight. It may only last for around 30 minutes at a time but you can reactivate it by taking pictures of it using a strong camera flashlight.